1. It’s already been done, and with much more expertise, reasoned analysis, and entertainment value, by Rob Neyer in his Big Book of Baseball Lineups. So why do I feel the need to tackle the already thoroughly tackled subject? Which brings us to . . .
2. It’s a way for me to goof off. 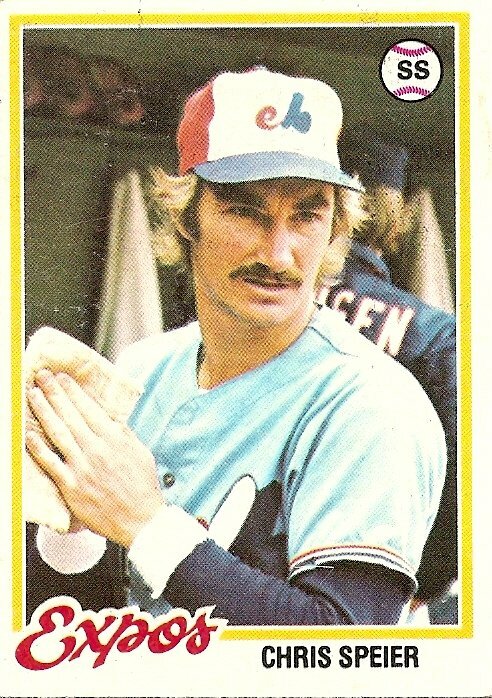 If I wasn’t publicly airing my choices for the greatest players ever to wear the clown cap of the Montreal Expos I’d be filling up my empty hours by thinking about it privately anyway. So why don’t I just keep my flimsy impressionistic baseball opinions to myself instead of polluting the Internet with them? Which brings us to . . .
3. I’m interested to hear other people’s opinions on the matter. Nothing I like more than a good baseball conversation, especially if the conversation mostly ignores recent events to burrow into the past. Which brings us to . . . The Montreal Expos and the surprising discovery that the greatest shortstop in franchise history might be the scowl-faced man pictured above. You are currently browsing the archives for the Chris Speier category.